Teeth grinding is a painful and frustrating condition for a considerable number of people. It can have harmful consequences for your long-term dental health. Your dentist will often diagnose the issue as bruxism and provide the solution in the form of a custom dental night guard. 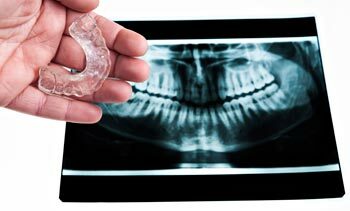 Custom night guards purchased through your dentist are often very costly with prices ranging from $300 to $500 and or even more in some cases. At Pro Teeth Guard, you can order a professionally made, custom dental night guard directly from the manufacturer — a professional dental lab. There is no need to overpay at the dentist when you can save money and place an order from the comfort of your home. Why do Dentists charge so much for a Dental Night Guard? You may not be aware that dentists don’t actually make the dental night guards they provide patients. They make a dental impression or mold of your teeth that is sent to a professional dental lab. The dental lab uses the impression to make a custom bite guards, that perfectly matches your teeth. They then send the completed night guard back to the dentist's office. The dentist pays the dental lab for the night guard and then charges you a 200 to 300 percent markup. Essentially the dentist is just placing the order to lab for you. Why wouldn’t you simply place the order yourself and save $200? ProTeethGuard.com is operated by a professional dental lab in San Diego County, California, where we let you order a custom dental night guard directly from the source. Place your order online here. We will send you an easy-to-use home impression kit for your teeth. Use the kit and bite into a dental putty to take an impression of your teeth. Mail your teeth impression to us in the prepaid envelope provided and our professional dental lab will create a custom fitted night guard perfectly molded to your teeth. The night mouth guard we create is the same quality as the one you would get from your dentist. Our professional dental lab currently makes and delivers occlusal guards for dentist offices here in California. We use the same professional dental materials and process for both our dentists and online customers at ProTeethGuard.com. "Never pay those ridiculous prices at the dentist for mouth guards again! This was so quick and easy and the price is totally reasonable. I received the kit in great time. Customer service was awesome, very attentive and friendly. I will definitely recommend this store to all my family and friends. Thank you Pro Teeth Guards!" There is no risk to you! We are so confident in the quality of our custom-made dental night guards, that we offer a 110% money back guarantee. If you’re not completely satisfied with the night guard you purchased, we’ll do everything we can to make things right. If for whatever reason we can’t resolve the issue to your satisfaction, you’re entitled to a full 110% refund (that’s right, we refund 110% of what you paid). Do you need a Teeth Guard? A night guard is a must for people who grind their teeth chronically while they sleep. While occasional teeth grinding is usually not a reason for concern, anyone who experiences frequent grinding should consider using a mouth guard specifically for grinding teeth. Habitual teeth grinding (also known as bruxism) exerts an excessive force (upwards of 200 lbs) on the teeth and the jaw joints. This type of pressure can cause wear and tear on the tooth enamel, as well as on the muscles and the joints in the jaw. Bruxism can lead to a variety of serious problems. These include broken and damaged teeth, headaches, and neck and jaw pain. Additionally, stress, anxiety and other difficulties can cause or exacerbate the habit of teeth grinding. How do Custom Dental Night Guards work? The guard is inserted into the mouth, and it covers the upper teeth. A well-made dental night guard should not be bulky, making it possible to sleep without being uncomfortable or having your breathing obstructed. The guard material cushions your teeth, which prevents them from grinding against one another. You can choose from two different types of night guards. One option is to buy an over-the-counter mouth piece, and the other is to have a custom-fitted mouth guard made especially for you. The over-the-counter mouth guards are less expensive than the custom made ones and come in two styles. One is a "boil and bite," and just like the name implies, you boil the guard to soften it and then bite down. This customizes the dental guard by creating impressions of your teeth. The other kind doesn’t require boiling. Instead, you use scissors to trim the guard as best you can to make it more comfortable. These types of night guards usually don’t provide the best fit, comfort or protection. Since over the counter guards are not made according to your exact measurements, you might experience irritation when you use them. The best option by far is to get a custom dental night guard direct from the lab. What are Dental Night Guards made of? The quality of the materials used depends on the type of night guard you have. The hard ones are made from a heat-cured acrylic resin, which is a hard, clear plastic material. The soft ones are made from heat-contoured laminate material. The dual-laminate night guards are hard acrylic on the outside and soft laminate material on the inside. It’s always advisable to choose a custom-made night guard for added comfort and effectiveness. Where can I get a custom dental night guard? You can order online now from ProTeethGuard.com below. Alternatively you can order through your dentist, but you will pay the additional markup.